Join us at the Entrance 2 Square of The Mall of Cyprus, on Saturday 2nd December, from 11:00 till 18:00, and enjoy SURRPISE GIFTS from Bank of Cyprus Antamivi Rewards Scheme. 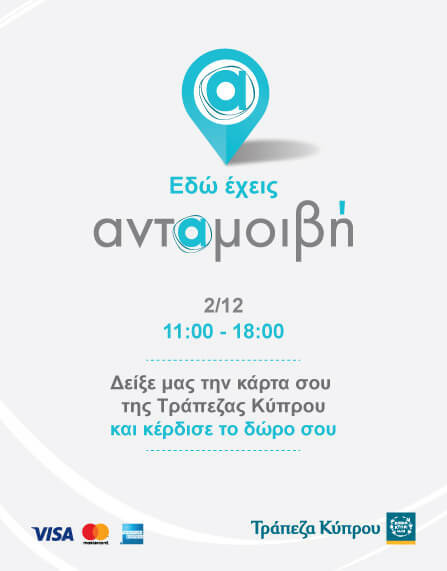 Find the Antamivi team at The Mall of Cyprus, present your Bank of Cyprus cards and choose your lucky envelopes which include various surprises from participating businesses. Also, enjoy an uplifting live link by Super FM from 11:00 till 13:00, with Marcos Komodromos and Christina Georgiou.